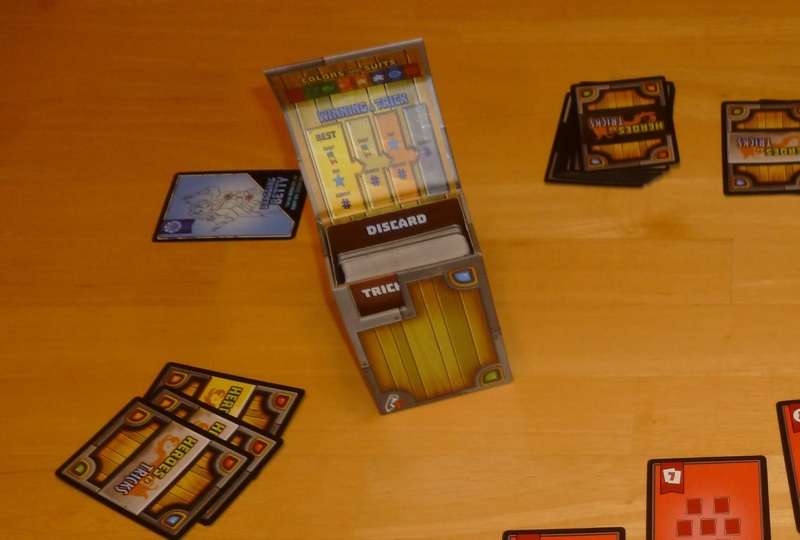 Heroes & Tricks is the second game from Pencil First Games that I have had the privilege to review and is the third title from them that I have been able to play. GemPacked Cards was my first review and Lift Off! Get Me Off This Planet is the other game I have played. I have become a fan of Eduardo Baraf's work and was looking forward to checking out his latest installment—Heroes & Tricks! Please note this is a preview and the images of the components do not represent the final product. The object of Heroes and Tricks is to gain favor of the most heroes by game's end. Players do this by winning the most tricks throughout the game. A trick is one round in the game where each player plays card(s) on a hero card. Once this is completed the winner of the trick/hero is determined by who played the highest valued card of matching color and suit as the hero or some variation if no one played a card of the same color and suit. To set up players separate out the four decks of cards which include the play cards, hero cards, gear cards, and epic gear cards (the latter two may end up combined in the final version). These decks are then shuffled and each player is dealt 10 play cards (in a four player game), 2 gear cards, and 1 epic gear card. After the hero cards are shuffled they are placed back into the box behind the divider facing backwards. Unused play cards are placed back in the box as well behind the hero cards, with unused gear and epic gear cards behind those. I have found that this is unnecessary when playing on a table and kept the unused cards face down out of play. Players then choose two play cards and one gear card to pass to the player on their left. This is an optional rule that may be taken out to speed up play. A standard game Heroes and Tricks is a single hand of cards played over a series of tricks (depending on the number of players) and begins with the lead player who takes the front hero card from behind the divider and places it in front of the divider facing forward. This becomes the first trick. Please note before the hero card is drawn players have the option to play a gear or epic gear card from their hand if labeled "play before trick". These cards can alter how the trick plays out, can add points to the trick, or force players trade cards. The lead player will then select a card(s) from her hand to play in front of the hero card in the box keeping it facing forward. The box is then closed and passed to the player on the left of the lead player. Note, players must play one of their play cards and can choose to play one of their gear or epic gear cards during a trick if labeled "play during trick". These cards are played behind the play card and have all sorts of fun abilities that allow players to make changes to the rules of the game or alter their cards. The next player opens the box and plays his card(s) in front of the previous player's card. Play continues until all players have played their card(s). The final player then pulls all the cards in front of the divider and lays them out in order to determine the winner of the trick. The player with the highest value card (after taking any gear and epic gear cards into consideration) that matches the color and suit of the hero wins the trick/hero. The card is then taken by the winner and placed in front of them for the duration of the game and is used at the end of the game to determine the winner. If no one correctly matched the color and suit of the hero, the player with the highest value card of the matching color wins. If no one matched the color then the player with the highest valued card with the matching suit wins. If neither the color or suit was matched the player with the highest valued card wins. Once a trick has been resolved all played cards are discarded behind the other discarded cards in the back of the box. Again if playing on a table I do not find this step necessary. We discarded our cards to the table with the other discarded cards. The player who resolved the trick now becomes the lead player and will draw the new hero card and place it in front of the divider to start the next trick. Play continues until players are down to two cards in their hand at which time the game ends and the player with the most tricks/heroes wins. Game end. Player 1 wins by a mile. There is a two player variant where players play 4 tricks before resolving and is played over three hands/rounds instead of one. There is also an extended game where the game is played over three hands/rounds instead of one. Heroes & Tricks is a fantasy themed game including your usual knights, wizards, dragons, swords, spells and other magical items and creatures. Although it is not needed, it is fun. The main mechanic at work here is trick taking, however it is done in a very clever way by keeping the trick and what other players play a secrete, thus creating a bluffing mechanic as well. Although I do not have the final version of the game, the artwork that is complete is fantastic much like other Pencil First titles. The illustrations and layout of the cards really help the theme pop and come alive. What really sets this game apart component wise is the box—a very clever storage case that also adds to the game play. The box has a magnetic lid that easily opens and closes as it is passed around from player to player concealing what each other is doing. It also has a unique cut out that only allows the players to see what color and suit the previous player has played. My favorite aspect of Heroes & Tricks is the subtle bluffing mechanic. Being able to dump a low card while messing with the next player is fantastic. Players are often left guessing whether or not the color and suit they see is the actual color and suit of the hero. This ties into the blind trick taking mechanic which is as enjoyable as it is frustrating when the tides are turned. The game can be setup and played quickly and the rules are easy to understand. The artwork and components are wonderful even though they are not final, so I can only imagine how polished the end product will be. Resolving tricks can be a bit confusing unless you make sure and layout the cards in order. This is compounded in a two player game when you have to resolve four tricks at the same time. I found myself staggering the cards when laying them out so that each players cards were offset towards them to make it easier to resolve each trick along with the final bonus trick (two player only). This is not a deal breaker but it takes someone with a perfectionist attitude to keep track of. Although trick taking games is not my preferred style of game I really enjoyed Heroes & Tricks. The way Eduardo and Jonathan tweak the trick taking mechanic was brilliant. I have not tried this game with my younger kids yet, but I have a feeling my 9 year-old will get it while my 7 year-old will not. We shall see, and I may need to do a follow up review. For right now Heroes & Tricks as a great filler game, however I can also see it becoming a tournament style game for longer game nights. Better buy multiple copies! Diamonds, Nyet!, Hearts, Spades, and other trick taking games will love Heroes & Tricks! I am giving Heroes & Tricks 4 out of 5 super meeples. Look for Heroes & Tricks coming to Kickstarter May 24, 2016.